This African Mango Diet Shake is a premium weight management drink ideal for anyone wishing to lose weight in a healthy and sustainable way. It contains an optimum balance of proteins and carbohydrates to keep you feeling full and well-nourished for hours. As part of a healthy diet and lifestyle this delicious shake can be enjoyed as a snack to help stave off hunger and support fat loss. With only 99 calories per shake you can enjoy this diet shake anytime! The active ingredient: African Mango is a potent weight-loss aid used to reduce fat cell growth and increase fat breakdown. African Mango, or Irvingia Gabonensis, is a tropical fruit that grows in the rainforest of Cameroon and Nigeria. It has recently been shown to aid in reducing cholesterol and stimulate an increase in fat burning. 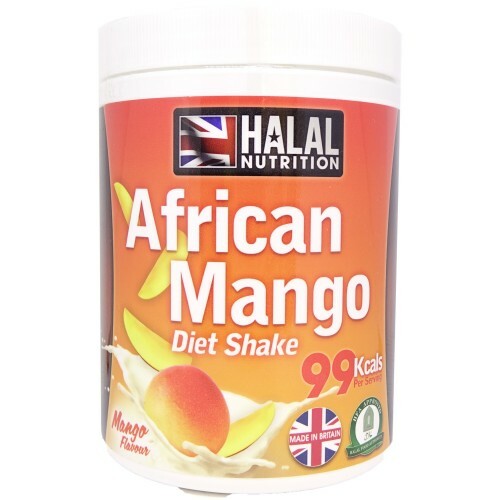 Our African Mango Diet Shake is the perfect accompaniment to your weight loss regime, and with its smooth texture and fruity flavour, doing the right thing for your health never tasted so good! Serving : 26g (approx. one scoop). Add powder to 150g - 175g of water in a shaker or blender, blend until smooth. Ingredients: Skimmed Milk Powder, Maltodextrin, Whey Protein Powder (Milk), Whey Protein Concentrate (Milk), Flavouring, Xanthan Gum, Natural Colourings, African Mango Extract, Sweetener: Sucralose.